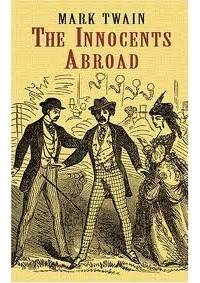 At first glance, Innocents Abroad is an ordinary travel book. It is based on an actual event, in a retired Civil War ship (the USS Quaker City). The excursion upon which the book is based was billed as a Holy Land expedition, with numerous stops along the coast of the Mediterranean Sea, as well as a train excursion from Marseilles, France to Paris for the 1867 Paris Exhibition, and a side trip through the Black Sea to Odessa, all before the ultimate pilgrimage to the Holy Land. Twain recorded his observations and critiques of various aspects of culture and society he met on the journey, some more serious than others, which gradually turned from witty and comedic to biting and bitter as he drew closer to the Holy Land. Once in the Holy Land proper, his tone shifted again, this time to a combination of light-hearted comedy and a reverence not unlike what he had previously mocked in his traveling companions. Many of Twain's criticisms were based on the contrast between his own experiences and the often grandiose accounts in contemporary travelogues, which were regarded in their own time as indispensable aids for traveling in the region. Above all others, Twain lampooned William Cowper Prime's Tent Life in the Holy Land for its overly sentimental prose and its often violent encounters with native inhabitants. Twain also made light of his fellow travelers and the natives of the countries and regions he visited, as well as his own expectations and reactions.